Kinsley glancingly refers later to the possibility that the prospect of leaving an estate might motivate people to work harder. But he completely ignores what seems likely to be a bigger effect: that it would motivate wealthy people to spend less. You can agree or disagree with the case that the estate tax impedes capital formation. Ignoring the debate seems like a poor way of winning it. I’ll confess that I’ve pretty much ignored this debate myself. I mean, you name the tax, and conservatives always have some white paper or another making an arcane argument for why raising it would wreck the economy and end up producing less tax revenue out of the ensuing rubble. The linked analysis is typical of the genre, full of vague handwaving and precisely zero actual evidence. 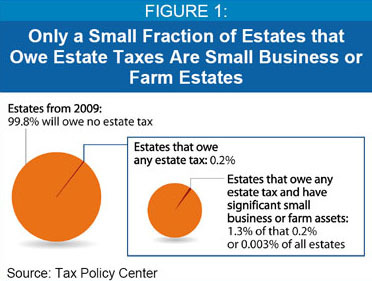 but it’s particularly good advice in estate tax debates, which are so rife with outright lies from conservatives — farmers! small businesses! socialism! — that it’s usually an offense against the English language to call them debates in the first place. If we’re going to spend any serious time on this topic, I’d rather spend it on finding ways to keep the super-rich from loopholing their way out of paying any estate tax at all, not pretending that our nation’s brave farming families will be devastated by a mere $7 million exemption. In the meantime, I’ll just make an obvious point: no tax lives in isolation. The question isn’t whether a tax is good or bad, it’s whether it’s better or worse than other taxes. After all, money has to come from somewhere, and whenever I ask myself whether it’s better for that money to come out of the pockets of dead people or live people — well, I always come up with the same answer. Selfish of me, I suppose.